During my son’s Senior year of high school the girls basketball team was really good and they made it all the way to the Indiana High School Athletic Association State Championship. Unfortunately they did not win – but everyone had a great time! I did not go to the event, but my son knows me well enough that he collected ephemera from the event so that I could scrapbook it for him! 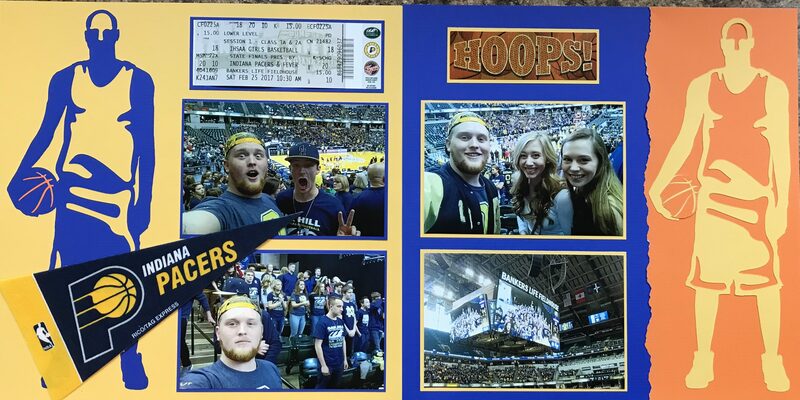 I chose a blue and yellow theme, which are the Pacers colors, since the championship took place at Banker’s Life Fieldhouse – the home of the Pacers. The two basketball player outlines, which serve as the borders for the spread, were cut using my Cricut machine. In fact – they are the same cut – I just used the leftover cut (on the left) from the cut used on the right. Notice that the borders for the photos and the ticket are same color as the background as the opposite page. This helps to keep the spread balanced, and color coordinated.